This cake is the perfect applicious dessert for Fall! I'm having it with a cup of chai tea. Care to join me? We can look at my Autumn book, by Susan Branch and enjoy a fine, Fall day. I'm using my Johnson Brothers, Harvest Time teacup. Isn't it a wonderful, vintage pattern? I love the soft colors and it goes so nicely with my apple cake. After 10 minutes, stir in the confectioners' sugar and vanilla. Beat well; if the mixture appears too thin, add more confectioners' sugar. Spread on the cake while frosting is still warm. The cake is even better and more moist the next day! 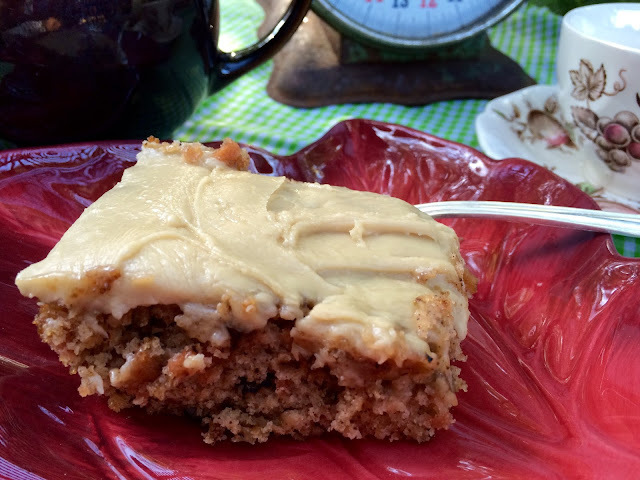 Kitty, I'm craving brown sugar fudge frosting with a side of apple cake this morning! I'm partial to JB Harvest Time since it was my grandmother's pattern. I have a few of her pieces that I enjoy of along with the memories they provide. Looks really good! I love anything made with apples. Hi Kitty, oh what a perfect setting for a fall tea. Love your gorgeous tea cup and the cake looks so delicious. Look how scrumptious on the leaf plate too. Presentation is everything and you do that so well with your talent for tea vignettes. Thank you for sharing the recipe. This is one to try for the season. Your cake looks wonderful, Kitty; especially sitting on the red leaf plate. The Brown Betty teapot looks very cozy with your JB teacup and saucer too. A pretty and delicious tea posting. Thank you for sharing with us today and thank you for your very sweet comment on my story. I'm so glad you enjoyed it. Hi Kitty, what a sweet tea time! Love your teacup and your cake looks so good. Thanks for the recipe! I am having two friends over for lunch soon and will make it for dessert! Hi Kitty, A few weeks back I watched a segment of Great American Food Finds on the Food Network channel where a lady in Yonkers, N.Y. made a sweet potato pound cake and frosted it with brown sugar frosting. She didn't provide the recipe, so I'm glad you did. The next time I make a pumpkin pound cake [that I blogged about today] I'm going to try your frosting recipe. Your teacup and saucer are the perfect match with the teapot for your Apple Cake. I think your whole table looks so very sweet. It is definitely apple time! Thanks for sharing Kitty. Oh how I would love to join you! It all looks AH.MA.ZING!!!! My mouth is watering, Kitty. I want to make this cake and chai tea sounds like a wonderful complement. Yu, just give me the whole bowl of frosting! What a perfect fall treat! What a yummy and delicious cake you're sharing with us...pinned...I will for sure try to bake it this fall!!! Is that Brown Betty teapot? I love Johnson Brothers china. I have a set that is similar to yours, and I use it during fall season!!! Your yummy desserts never fail to make my mouth water, Kitty! Your Harvest Time teacup is perfect for drinking spiced teas during these cool fall days. This is the epitome of a fall dessert! I so wish I had a piece right now...and again for my coffee in the morning. :) The tea cup and saucer are perfect also. Hope you're enjoying this lovely weather we're having! Ignore the weather forecasters about Wednesday and higher temps. Your cake looks amazing, Kitty! I have made an apple cake you blogged about before with (I think it was called) caramel fudge icing. It too is delicious! Hope things are going well for you and your family. Love your fall vignette Kitty, including that scale and apple candle, and the Johnson Brothers teacup. What a great pattern. That apple cake looks delicious! Would love to sit and have a cuppa with you, and a piece of that cake. The apple cake looks so delicious and would be lovely with a cup of tea. After pumpkin, apple flavors are my favorite. Your Johnson Bros. teacup is perfect for a fall tea. I've never seen that pattern before. 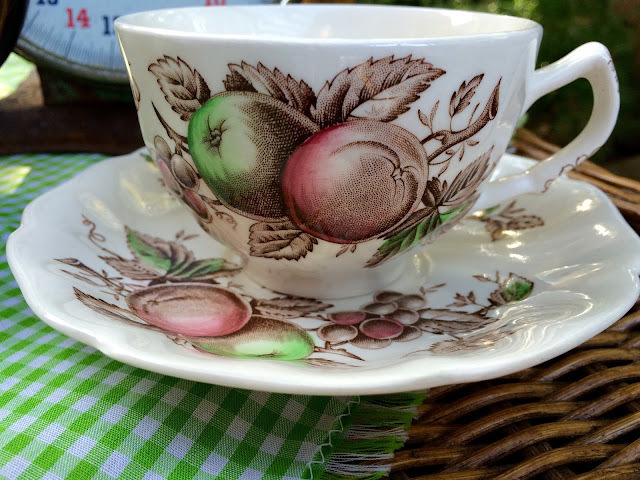 You don't see many teacups with apples in the design. It would go well on a Thanksgiving table as well. The Brown Betty teapot completes the fall look. Enjoy your week! Your apple cake sounds and looks so delicious. The Johnson Bros teacup is so pretty. 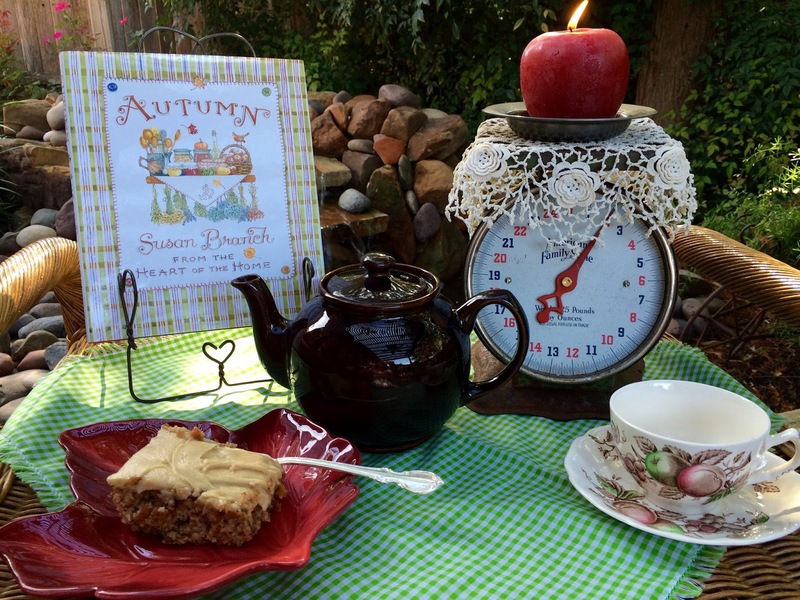 What a delightful way to spend a leisurely afternoon or morning with cake, tea, and Susan Branch's Autumn book. This looks so good and I can't wait to try this recipe. Thanks so much for sharing it with us. This sounds wonderful and I'm saving the recipe. Hope you are having a beautiful fall. What a pretty setting...love the apple teacup as well as the 'apple' candle...cute! Is that a vintage Brown Betty teapot??? I remember my Mom's. She always made us tea in it when we were sick. Your apple cake sounds very much like the one I've made for years but I never thought to put nuts in mine! Nor did I ever put frosting on it. I think YOUR version is much, much nicer. I hope our gorgeous autumn weather holds for your visit later this month. Very pretty here today. Lovely setting Kitty. The apple candle is so cute! Vintage teapot is precious. You are always baking up a storm and this looks so good. I am glad you can still enjoy your lovely spot outdoors. Hi Kitty, I love your pretty setting with the cute apple candle. Your apple cake looks AMAZING! Thank you for joining and sharing your wonderful recipes with us at Cooking and Crafting with J & J. We love having you. Enjoy your week. What a beautiful Autumn setting...and that cake...OH MY...apple ANYthing is such a favorite of mine. I can't wait to make this....thanks so much. My mouth is watering. For the cake and the tea cup! Hi Kitty! I need to email you concerning a Christmas Blog Hop. Would you mind emailing me so I can return some info to you? Kitty, the cake looks so delicious! I thought perhaps it was a maple icing before I read the recipe. When my husband comes home, I look forward to baking this! What a pretty autumn tea table with your teacup and apple candle. I'll be trying this cake for sure and remember making a brown sugar frosting for something a long time ago, it did taste good. Your apple cake looks delicious, I'm definitely going to give it a try. Thanks for sharing! That closeup of the frosting on that cake makes me want to bake right now! It's 11:00 PM!! IT looks absolutely amazing and just full of some favorite flavors of mine! YUMMY! Hi Kitty, stopping back by to say hello and so love seeing this beautiful post once again. Such an inspiration to try and do some baking this weekend. Thanks for stopping by today too and your kind comment. Hi Kitty, I love brown sugar frosting! This cake looks delicious! Your teacup is just perfect for fall! I found a couple of juice glasses and creamer with plaid apples around the top the other day. Thanks for sharing with SYC. Oh yum Kitty, this cake sounds delicious. Saving this recipe. Pretty tea cup. MMMM! I LOVE an apple cake and haven't made one in years. Would taste even better eating it on your lovely dishes. Thanks so much for sharing with us at Weekend Potluck. Brown sugar fudge frosting!!!! Yes please!! This looks so good Kitty and so pretty with your apple tea cup! A perfect setting for your Old Fashioned Apple Cake, it looks delicious. Hope you are having a great weekend and thanks so much for sharing with Full Plate Thursday.